Recently I acquired an iPad. Actually I won it in a raffle. I am pretty excited to have the newest thing on the block for once in my life and am looking forward to sharing my experiences using it in the classroom with my students once I get it set up and into a hardy case. For now I am going to share what it is like to try to blog from the iPad. Blogging on the iPad is a pain in the.... Well you know. I use Blogger for most of my blogs and mobile Safari does not work with "compose mode" in blogger. I don' know if it is a bug or Apple being their usual proprietary selves but if you want to compose a blog post in Safari using Blogger you better be ready to code some HTML. There was a time when I was quite good at coding in HTML but it seems since 1997 that space in my brain was replaced with other knowledge. Attempting to use Blogger on other iPad web browsers wasn't much better. Atomic Web Browser (not the free version) wouldn't let me click on the text edit box for the body of the post and all of the others I tried (three in all) had similar bizarre issues. I stand six feet one inches tall at this point in my life and my hands reflect my height. Squeezing my fingers together and attempting to type type is a no go. Hunting and pecking is painfully slow. I typed blog entries faster on my Blackberry a year ago than I do using the iPad. Carrying a Bluetooth keyboard seems to defeat the purpose of a device that fits in a manilla envelope. There is a blogging app called BlogPress which I have used successfully on my iPhone and works well from my iPad however it has a reputation of destroying posts instead of posting them and crashing when you try to use a Bluetooth keyboard. Some searching on the internet found that some bloggers are using Pages, Apple's word processing app to compose entries and then using either the e-mail feature of Pages combined with the e-mail to post option on most blog hosting sites to send the text. A great idea, except it is lots of work and the number of steps increases the possibility if a mistake. Inability to multi-task on the iPad combined with no tabs in Safari and difficulty copying and pasting since I don't seem to have magical fingers means that I can't create posts in my usual manner with many open internet browser windows and lots of copying and pasting. Much frustration ensured for me as I tried to make things work. Automatic spell correction continues to be an issue for me, both on my iPhone and the iPad. I have dyslexia and Apple's spell correction never fails to be unable to figure out what word I mean, constantly replacing misspelled words with correctly spelled words that make no sense at all and have nothing to do with what I am writing. Having to constantly stare at my hunting and pecking fingers I don't notice that a half dozen words in a paragraph have been replaced with non-sense until I stop typing and check my work. When I am emailing people I am close to I just leave the mistakes, my friends understand, but I want my blog readers to think I have some mastery of the English language so a lot of time is spent fixing things. (Yes, I know I can shut off the spelling correction, but I can't spell so I need some kind of spell checker/corrector. That is no happy medium, you can't for example get spelling suggestions without automatic word replacing. Automatic capitalization creates similar problems. I am constantly trying to convince the iPad that either I DID mean to capitalize that word or that I DID NOT mean to capitalize that other word. That's about it. I should say that over all I really do like the iPad and I think it will have a number of very useful implications in my classroom and at home, but blogging just doesn't seem to be one of them. For the record this blog entry was created in the Pages app on my iPad and then imported into the BlogPress app to be posted. All of the formatting done in Pages was lost when the entry was moved into BlogPress, I added spaces between each section, but did not attempt to fix the loss of numbering those sections that happened as it is just too much work. Find out about toothpaste and lotion batik at MaryMaking. This video was sent to me by Celia Mari, from "Juegos de Atencion Temprana", a special education/assistive technology blog much like this one in Spanish. Celia didn't know much about the video except that it was part of a contest. I think it is a wonderful "AT in Any Language" statement. Sometime ago I posted several entries about a theme unit on "The Princess Bride ". With an entirely different group of students this unit is once again in action in our classroom. The first week we focused on the movie and the characters, including Princess Bride Bingo, ship races like that between Vizzini and his crew and the Man in Black and making Miracle Max Revival Pills (chocolate covered rice crispy treat balls). We also reviewed the story of The Princess Bride and took a little quiz. Week two we focused on pirates including a giant pirate flag mosaic, (foam) pirate sword fights, pirate maps, pirate jokes (via a free iPhone app) and the making of various pirate props (eye patches, hooks, hats). Next week we will focus on the animals of The Princess Bride - eels, ROUS (Rodents of Unusual Size - Capybaras) and horses. We will make "eel" appetizers and paper plate eel crafts in addition to learning about eels, capybaras and horses. We four will focus on "If I were in the Princess Bride". We will learn about our assets, focus on the characters and which our favorites are and why we like them. We will make trading cards at ReadWriteThink.org and do some rhyming like Fezzik. We will also catch up on all the projects unfinished from the first three weeks! Week five will be about Princess Bride Sensations! We will try our hand at making things sink or float in water, work with sand like the lightening sand in the Fire Swamp and create a tactile board game (as well as play it). Finally week six will be our wrap up week with time spent scrap-booking about our summer of The Princess Bride and preparing for our end-of-summer theme party. One of the roles we play as teachers is sometimes to point out resources and be a guide to parents and caregivers, other times it is to just listen and still others it is to create positive relationships where there are negative expectations. Often times it is our biggest task just not to judge, parents of our students frequently have plenty of that in their lives with out us adding to it. Having just hung up the phone I am reflective of what I have just learned about one of my former student's from her mother. I had been warned that this mother was, "difficult" before I ever met her. Having literally taught classes about working with difficult parents I set about trying to be a supportive resource and build trust. Frequently I would spend time talking at length about possible educational interventions, getting names and phone numbers of community resources and sharing techniques to use at home with this parent. The more we worked towards creating a positive, proactive parent/teacher relationship the more I understood that this parent was frustrated by being both told she should do more about a variety of issues (from feeding to behavior) and yet not knowing what to do. We came to work well with each other. During that time it was noticed my student/her daughter was losing her vision. She was fairly new to me as a student and had goals to do things like read sight words, yet she could not seem to see even very large white on black picture symbols. Additionally communication was a huge issue, as pointing to symbols was no longer a viable option and exploration of AAC systems rolled to a halt. Eventually a vision evaluation found both cataracts and optic nerve disease. Her mother and I discussed these findings at length and it was a learning moment for both of us, she learned about the optic nerve and I learned how vital it is to explain things when no one else has, as understanding can bring action. That conversation lead to modifications both at school and at home to meet her vision needs. 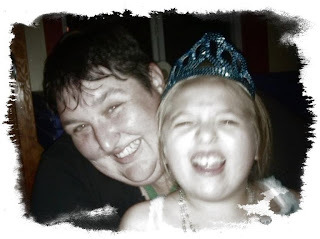 I did some research and shared some phone numbers her mother made some phone calls to our state's Federation for Children with Special Needs and from there to a Birth Defects Clinic and finally (back) to Children's Hospital, in hopes of better understanding what what happening with her daughter. 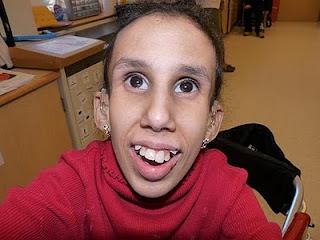 At age fifteen after having been misdiagnosed with everything from cerebral palsy to hepatitis to Usher Syndrome this young lady was diagnosed with Cockayne Syndrome. Cockayne Syndrome is an extremely rare disorder and upon reading the diagnostic features I knew immediately that this young lady finally had a proper diagnosis (although genetic testing certainly seals the deal). Her mother was excited and relieved to share this with me, although with sadness told me she did not want to talk at all about the long term implications. She told me how relieved she was to know that things people had implied were her fault including nutritional issues and skill loss were genetic. She spoke of having attended the recent conference and everything she learned there, from anti-oxidants as part of treatment to vision interventions. She was excited to be about to take a course on deafblind communication. We hadn't talked in over a year it and was wonderful to hear of all the positive happening in the family. At the end of the conversation there was a thank you for sowing the seeds of hope with kindness. It left me thinking what a vital part of our job sowing the seeds of hope can be. I would like to thank the mother in this story for permission to share it on my blog and permission to share her daughter's photo.